Our adventures started yesterday and we got off to an excellent start. My next post will give an account of the session .... But first I thought I would share a little more about the planning. Here's a picture of part of the pre-planning "bubble map" we have drawn up for the weeks ahead. This is just the first section of the map - the whole thing is four pages long. 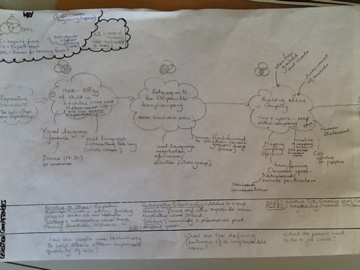 The idea of bubble maps is one I pinched from Julia Walshaw at Bealings School, UK. Julia was using them as a retrospective account of her teaching - written AS the emergent inquiry went along. In our case, with so many different teachers and student teachers involved we use the maps more pro-actively - as an overview of where we INTEND to or MIGHT go. The last couple of times we have ended up deviating from the map - but nevertheless were glad to have it. The map is deliberately hand written in pencil as this gives a sense of being individual/ tentative / draft / subject to change / unfinished. As a general point, I always liked Dorothy Heathcote's use of handwritten / drawn materials and prefer to handwrite most things - even classroom resources such as name tags, notices, letters where possible. The bubbles along the map loosely indicate "episodes" in the teaching. Mantle of the Expert, like process drama, is episodic in nature. An episode is like a gear shift in the unfolding story of the drama - a change of idea or focus and often a shift in TIME. Sounds complicated? For now, what matters is that episodes do not equate to lessons, or sessions, as sometimes one episode will last for several sessions, whilst at other times we may pass through several episodes in one session. The section of the bubble map shown here gives the episodes we passed through in session one. First we "hooked" the students with a dramatic scene then we started edging in to the idea of the responsible team or company we would become and finally, we started building belief in the company. Along the top of the map are a series of venn diagrams. These act as a 'key' to indicate whether the teaching mode is predominantly within Inquiry (I), Drama for Learning (DFL) or Expert framing (EX). The idea of including the venn diagram was proposed by a student a few years ago and I've used it since as it helps me recognise which kind of teaching mode the different episodes support. A few more things to mention. Within the bubbles, I describe the main purpose of the episode - what it's for, and what the TENSION will be. Mantle of the Expert, like process drama (like ALL drama) is spun together with tension and so it can be most useful to identify what kind of tension is driving each episode. When working with student teachers, I encourage them to identify the 'level' of tension in relation to Heathcote's twelve levels of tensions. The arrows pointing into the bubbles indicate what we, as teachers, need to prepare and take "into" the sessions. The ideas dropping out of the bottom of the bubbles are the tasks that are likely to emerge. Of course, the teacher will remain open to other, emergent opportunities but mapping like this allows us to anticipate things we MIGHT get the students doing and prepare resources etc. This part of the map is also where the teacher can identify curriculum specific tasks - and indicate links to level, AOs, strands etc. As teacher I will often produce more detailed micro planning for particular tasks to ensure the curriculum learning is of a good quality. This micro planning can't be done too far in advance, as it is informed by the unfolding drama and the individual needs of the children. The bottom of the map shows two horizontal strips. These are where I record Key competencies and Big Questions emerging from the episodes. In many ways, I believe these aspects are the most important "real" bits of learning so it's important as teacher to tease these out carefully. Key Competencies can become a bit of a tick box Thinking - yup, they're doing that. Participating and Contributing - yes - tick! So I am careful to ponder and really identify what kind of Thinking or Participating and contributing is taking place. For anyone reading this who doesn't know.... the New Zealand Curriculum identifies Five Key Competencies: Thinking, Participating and Contributing, Relating to Others, Understanding Language Symbols and Texts and Managing self. It's a key feature of our curriculum that these are "up the front" of the document - along with Values and Principles - something that makes our Curriculum quite unique and VERY well suited to Mantle of the Expert...! Big Questions are the 'human' or 'philosophical' issues addressed by each episode. Dorothy Heathcote might have called them the "universals" - though of course that term has a lot of assumptions embedded in it! It's always important to stand right back from the drama and consider what the work is asking us to consider. The bottom strip on the map encourages the teacher to identify and formulate these big questions - which might even be posed and discussed overtly in the classroom during reflection time. Week one - the adventures begin!